Dzire is available in 5 different colors - Silky Silver, Cave Black, Sangria Red, Magma Grey and ALP Blue. Watch latest video reviews of Maruti Dzire to know about its interiors, exteriors, performance, mileage and more. The Swift Dzire is Here! 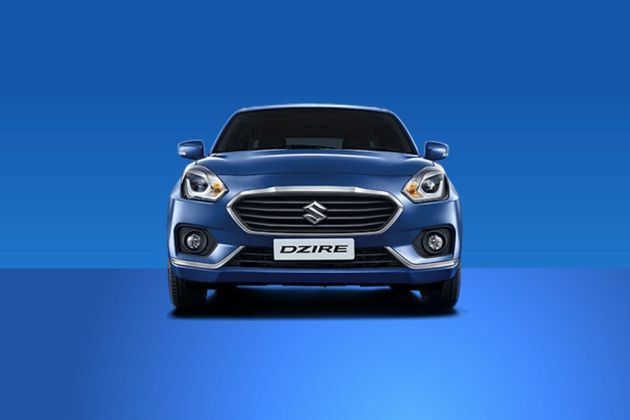 The Dzire is the entry-level sedan of the Indo-Japanese duo Maruti Suzuki. The brand recall of the compact sedan is so powerful that the company has decided to drop the ‘Swift’ moniker from its successor to provide the new gen model its own unique identity. In the sub-4 meter segment, Maruti Swift Dzire has been a leading player. First introduced in the year 2008, Dzire’s second-generation model came to light in 2012 and the minor updates were provided in 2015. And all through the journey, the vehicle has been dominating the segment by a fairly wide margin. The Dzire, now in its third-generation has big shoes to fill. The all-new Dzire gets new exteriors and interiors, updated safety and tweaks to the powertrains as well. The front façade of the Dzire looks smart with large blacked out radiator grille that resembles the Ford Aspire. The grille is surrounded by the chunky chrome strip. The new almond shaped swept back headlamps housing the LED projector headlamps lend a premium feel to the car. The front bumper features big air-intake, the design seems more curved along with muscular bonnet carried on to the front fenders. On the side, the car gets attractive 15-inch diamond shaped alloy wheels while the roof flows from A to C pillar quite smoothly. At the back, its large horizontal chrome strip, as well as LED tail lamps, goes well with overall looks. Maruti Dzire is available in six colour patterns they are Pearl Arctic White, Silky silver, Magnum Grey, Oxford Blue, Sherwood Brown, Gallant Red. Maruti has done an exceptional job in terms of interiors, the layout is quite pleasing and driver-focused. New Dzire offers maximum comfort, space, and pleasure. The dual tone theme of black and beige offers attractive ambiance. The major change in the design is the new driver-centric center console- that has been slightly moved towards the driver for easy control. The seats are very well sculptured and offer the right amount of bolstering. The car gets new 7.0- inch touchscreen infotainment unit with Android Auto and Apple CarPlay. The feature list includes reverse parking camera along with sensors, push start/stop button, electrically adjustable and foldable ORVMs, rear AC vents and automatic climate control. New Dzire is offered in both the petrol and diesel mills. The 1.2L petrol engine can generate power output of 83bhp and peak torque of 113Nm. While the 1.3L diesel powertrain belts out the power output of 75bhp and maximum torque of 190Nm. Both the motors come mated to five-speed manual transmission or AMT option. Both these engines have been tweaked to return more fuel efficiency with the diesel and petrol variants delivering 28.4 and 22kmpl respectively. Looking at the growing concern about safety, Maruti has upped the game in this department. The vehicle gets ABS with EBD, Brake Assist, dual airbags and ISOFIX child seat as standard across the range. Other features include central locking, engine immobilizer, turn indicators on ORVMs and rear wiper and defogger. New Suzuki Dzire is offered in 14 different variants. In terms of pricing, it is tagged a little higher than the outgoing model. Its base trim is available at the price tag of Rs. 5.56 lakh while its top of the range model Z+ is priced at Rs. 9.43 lakh. The top selling model VDI is tagged at Rs. 7.44 lakh, ex-showroom, New Delhi. The inside of the car is fresh and make you feel that the vehicle is built around you, irrespective of your sitting location. The beige and black theme is the same but the design is fresh. The design of the dashboard is also new and fashioned so carefully in order to make maximum space for the front passengers. There is a healthy dose of wood on the dashboard, steering, and the door armrest. People who own the previous model wouldn’t find much difference in the plastic quality. The instrument cluster is white-backlit, while the chunky steering wheel and how the infotainment is tilted towards the driver, will make you feel like home. The seat of the driver is comfortable with better cushioning and provides enough under-thigh support and side bolstering. There is ample room for the height adjustment as well. The rear seats are the place where you feel the most special, thanks to the new platform which makes the seats utterly spacious. The carmaker has upped the game into the comfort department with the car getting rear ac vents and 12V charging socket in the middle. Further, you also get center armrest, bottle holders in both the doors and 2 cupholders. The 7-inch SmartPlay touchscreen infotainment is familiar and responsive. Besides the facility of inbuilt navigation, the system can be connected to either iphone through Apple CarPlay or android smartphones through Android Auto. It can also be connected to Mirror Link as well as provides visuals for rear parking. Rest, the usual USB, Aux, and FM are also there. Other features in the car include automatic climate control, keyless entry, engine start/stop button, electrically adjustable ORVM, steering mounted audio controls and automatic headlamps. And with boot space growing to 378L, Maruti has really improved its stance in the segment when it comes to inner comfort and space. Despite its enormous success in the segment, the Dzire was never a smasher. But with the all-new generation model, the car is now more seductive. It does look like a proper sedan now. The major change can be seen at the front as the carmaker has given a retro look with a wide pouty grille surrounded by thick chrome lining. The car features stylish LED projector headlights with daytime running LEDs which is something seen in the segment above cars. Move to the side and the gorgeously looking 15-inch precision-cut alloy wheels will steal your heart, but sadly it is only available in the top spec variant. The new body shell features soft curves and flowing character lines all across. The rear profile is a simple business with a thin chrome strip merging with the LED tail lamps, which is a standard fitment. The LED elements look cool especially when they emit. The wide derriere and the wheel arches make the rear looks more mature than the previous one. Due to the lesser kerb weight of the newer model, the engine load is reduced and hence, it doesn’t have to work as hard as earlier. This equals to higher fuel economy. The diesel Dzire can return 28.40kmpl while the petrol one delivers 22kms for a liter of fuel. Maruti has managed to make the suspension setup work quite silently. And this can be seen in compliant ride quality and neutral road behavior of the car. Small bumps can be absorbed quite well without roughness and lumpiness. Even on open roads, the bumps and undulations are trouble-free. At high speeds, the car can go on cruising 100kmph the whole day without breaking a sweat. The engine options remain the same as before. Where the 1.2L petrol engine produces 82bhp and max torque of 113Nm, the diesel one, on the other hand, makes 74bhp and peak torque at 190Nm. This time around, Maruti is worthy of getting a big round of applause for offering 6 automatic variants in the line-up. Both diesel and petrol variants can be availed either in 5-speed manual or AMT gearbox. Like before, the petrol powertrain is silent and refined as soon as you hit the start button. Power delivery is smooth and revs build up in a linear manner. The diesel engine requires very less downshifts for the quick progress that results in higher efficiency at highways. The creep function of the AMT is perfect for the stop-go city traffic. Similar to the previous version, the new-gen Dzire comes fitted with disc brakes at front and drum at the rear. The brakes are responsive and the performance is noticeably better. The dual airbags, anti-lock braking system (ABS), electronic brakeforce distribution (EBD) and brake assist come standard in the car. Other safety aspects include reverse parking sensors, front fog lamps, rear defogger, anti-theft security system, engine immobilizer and speed sensitive door lock. So, the carmaker has smartly packaged the car to maintain its dominating stance in the segment. What is the price of Maruti Dzire? On road prices of Maruti Dzire in New Delhi starts from ₹ 6.56 Lakh for base variant LDI, while the top spec variant AMT ZXI Plus costs at ₹ 8.43 Lakh. What are the colors options available in Maruti Dzire?